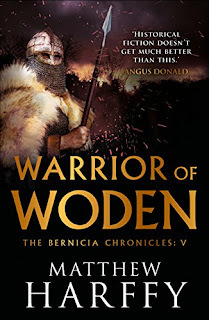 Bernicia Chronicles: WARRIOR OF WODEN is out NOW! WARRIOR OF WODEN is out NOW! It feels like it's been a long time coming, but finally the day is here for book five of The Bernicia Chronicles, WARRIOR OF WODEN, to be unleashed on the world! If you pre-ordered, it should have already appeared magically on your e-book reader. If you didn't pre-order, what are you waiting for?! I hope you enjoy the book, and please leave a review on your online site of choice once you are finished reading it. As writers are so fond of saying, reviews really do help others to find books and to take a chance on a new author. WARRIOR OF WODEN is currently available as en e-book and print on demand paperback. It will be available soon as an audiobook (date TBD) and in other print formats (hardback and mass market paperback) next year.